Progressive I-Can Opener. Do you suffer from decreased hand strength or problems gripping? Is opening a can difficult? Then the Progressive International I-Canª Opener is the perfect kitchen gadget for you. 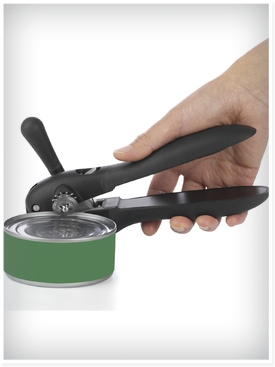 The I-Canª OpenerÕs revolutionary ratchet handle design makes opening cans effortless and easy. Simply lock the opener onto the can, ratchet the handle back and forth and press the button to unlock the handles when done. Great for right or left-handed users.Comfortable soft-grip handles do not require a strong grip or squeezing to keep the I-Canª Opener on the can. Dishwasher safe. Made of sturdy plastic and stainless steel.